Decentralization works best when there is a robust legal framework, political will, clearly delineated responsibilities, accountability mechanisms and – most importantly – a shared vision of all actors involved as to how decentralization will contribute to achieving better governance results, improving the lives of ordinary citizens. 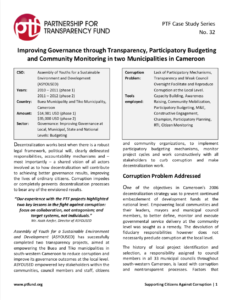 Corruption impedes or completely prevents decentralization processes to bear any of the envisioned results. Mr. Asah Azefor, Director of ASYOUSED Assembly of Youth for a Sustainable Environment and Development (ASYOUSED) has successfully completed two transparency projects, aimed at empowering the Buea and Tiko municipalities in south-western Cameroon to reduce corruption and improve its governance outcomes at the local level. ASYOUSED empowered key stakeholders within the communities, council members and staff, citizens and community organizations, to implement participatory budgeting mechanisms, monitor project cycles and work constructively with all stakeholders to curb corruption and make decentralization work.